Summer Sampler Series : Halfway There! We are now halfway through the tutorials for the Summer Sampler Series. I just wanted to share the blocks, all together, so far. I am loving this! I hope those participating are enjoying learning some new skills. I know I am. And for those that aren't quilting along, I hope you are enjoying seeing the blocks. I've had a few people ask if the tutorials will be around for awhile. 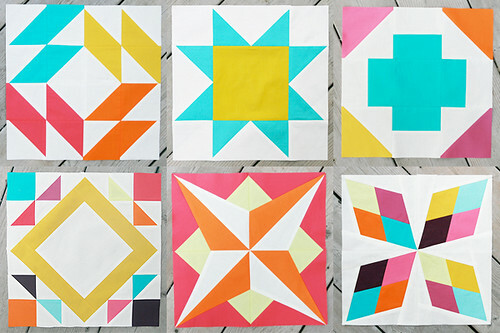 Be assured, if you ever want to make one, two, or all of these quilt blocks, the tutorial links will be up on my blog indefinitely.